Indoor air quality and energy efficiency are not separate issues — Mike Nankivell. With the emphasis placed very much on energy efficiency of buildings, it is understandable that indoor air quality (IAQ) seems to take a back seat in wider discussions about building design and operation. However, an energy-efficient building is of no use to owners or occupiers if it cannot provide a healthy and productive working environment. Indoor air quality (IAQ) is a rather broad term that can encompass the quality of the air in a building, as well as temperature and humidity. 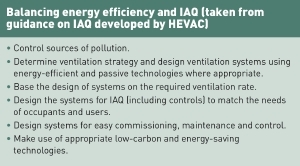 From HEVAC's point of view, many of its groups have an interest in IAQ and in promoting good design and installation to support it. In the modern world, we spend 90% of our time in buildings, so the issue of IAQ is very important. 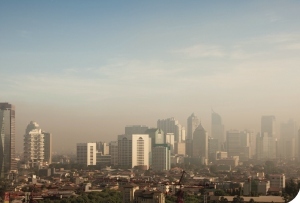 The illnesses that can be caused by poor air quality in buildings can be serious, including cardio-vascular diseases, lung disease, asthma, reduced immunological defence, eye irritation and headaches. The term 'sick building syndrome' is not so often heard today, but it can be characterised as a collection of these symptoms caused by poor IAQ. In the 1970s it was particularly linked to poorly designed office blocks where ventilation had not been properly considered. The quality of air is very much affected by the particles in it. There are many particles and gases within office space that can have a negative effect on occupant health. Office furniture such as carpets and equipment such as photocopiers produce particulates that can damage health, so good ventilation is vital to keep the air 'fresh'. According to an EU report, the ‘Burden of disease’ falls heavily on outdoor air. What may be less obvious is that outdoor air entering a building can be even more harmful for occupants. The Healthvent EU Project Report 2013 (see second link below) shows that the 'burden of disease' falls heavily on outdoor air; 49% of potential cardio-vascular diseases are the result of particulates in outdoor air coming into a building. This is understandable when we consider that outdoor air carries traffic fumes, and can be particularly unhealthy in urban environments. Both Walter ter Kuile and Reg Cross agree that filters do have an impact on energy efficiency. One of the important issues about filters is that there is currently very little regulation on this area. The HEVAC filter group also works with British Standards to work on this area, and has been involved in trying to draw attention to the importance of filters within European legislation such as the Energy Performance of Buildings Directive (EPBD). Ventilation is another important factor in creating a healthy indoor environment. Here, good design and a well thought-out ventilation strategy are vital to achieve good air movement in an energy-efficient way. For example, air exchange between a building and outdoors needs to be sufficient to maintain IAQ, but should not be excessive. When it comes to balancing indoor air quality with energy efficiency, it is clear that good specification is required, along with a robust maintenance programme to monitor filter cleanliness. There is no reason why good occupant health cannot be achieved along with good energy efficiency.